Topical metadata have been used to indicate the subject of Web pages. They have been simultaneously hailed as building blocks of the semantic Web and derogated as spam. At this time major Web browsers avoid harvesting topical metadata. This paper suggests that the significance of the topical metadata controversy depends on the technological appropriateness of adding them to Web pages. This paper surveys Web technology with an eye on assessing the appropriateness of Web pages as hosts for topical metadata. The survey reveals Web pages to be both transient and volatile: poor hosts of topical metadata. The closed Web is considered to be a more supportive environment for the use of topical metadata. The closed Web is built on communities of trust where the structure and meaning of Web pages can be anticipated. The vast majority of Web pages, however, exist in the open Web, an environment that challenges the application of legacy information retrieval concepts and methods. Sullivan (2002c) reports that the meta keywords tag, an HTML element designed for adding descriptors to Web pages, is regarded as untrustworthy and avoided by all major search engines. A FAQ at the Dublin Core site explains that well-known 'all the Web' search engines 'tend to avoid using the information found in meta elements' for fear it is spam (FAQ). Applying topical metadata to Web pages provokes a controversy that pits partisans who envisage a semantic Web featuring topic maps and ontologies of shared meanings (Berners-Lee, Hendler & Lassila, May 2001) versus detractors who disdain topical metadata as 'metacrap' (Doctorow, August 26, 2001) and warn us of a Web of deception (Mintz, 2002). The significance of the controversy, however, awaits the examination of a more fundamental issue: does it make technological sense to add topical metadata to Web pages? If the Web is a big, distributed document database and Web pages are composed in HTML (i.e., 'the document in my browser goes from <html> down to </html>'), the answer is ‘yes.’ In this case, it makes technological sense for Web authors to add topical metadata to Web pages, just as an indexer might add descriptors to a document in a database. An affirmative answer validates the topical metadata debate. If, however, the Web is not a big document database, but is instead a network of rapidly changing presentations, the answer is ‘no.’ In this view HTML is primarily a presentation technology, and most Web pages are transitory and volatile presentations governed by the whims of viewer taste and the contingencies of viewer technology. A negative answer signals that debating the value of topical metadata is premature until it can be shown that they are technologically appropriate additions to Web pages. Lurking behind the topical metadata controversy is our unsteady application of the concept of 'document' to Web content and presentation. We inherit our notion of document from vertical-file systems and document databases, technological environments not known for schisms between content and presentation. Viewed from the document-database tradition, indexing Web pages appears to be a simple extension of current practice to a new, digital form of document. Viewed from the HTML tradition, however, indexing Web pages confuses presentation for content. Topical metadata are intended to index information content, not arbitrary or personalized views of content, and the majority of Web pages are arbitrary presentations contingent on Web browsers, security settings, scripts, plug-ins, cookies, style sheets and so on. Considering the appropriateness of the document metaphor for the Web has fundamental consequences for the application of IR’s extensive body of theory and practice. Controversies about topical metadata aside, recognizing the familiar IR notion of 'document' on the Web would suggest that Web searchers are retrieving information, and that we can apply IR concepts and methods to help Web searchers. In this case, the topical metadata controversy gains significance. Realizing that the document metaphor does not map to the Web, however, heralds a paradigm shift. Perhaps Web searchers are not retrieving information, but doing something else. ‘Web search’ is used in this essay to name the activity of discovering, not retrieving, information on the Web. The first and most obvious place where appropriate content identifiers might be found is the text of the documents themselves, or the text of document titles and abstracts…. Such a process must start with the identification of all the individual words that constitute the documents…. Following the identification of the words occurring in the document texts, or abstracts, the high-frequency function words need to be eliminated… It is useful first to remove word suffixes (and possibly also prefixes), thereby reducing the original words to word stem form. (Salton & McGill, 1988: 59, 71). The application of computer databases by mid-20th century spurred many information communities to establish or promote social conventions for their information. For example, the Education Resources Information Center (ERIC), 'the world’s largest source of education information' (Houston, 2001: xiv), represents a community effort to structure and index the literature of education. At the height of the database era in the late 1980s, vendors such as the Dialog Corporation offered access to hundreds of databases like ERIC, each presenting one or more literatures structured and indexed. This social cooperation and technological conformity fostered the impression that, at least in regards to certain subject areas, the experts had their information under control. We are now just learning that the Web has a different social dynamic. The Web is not a benign, socially cooperative environment, but an aggressive, competitive arena where authors seek to promote their Web content, even by abusing topical metadata. As a result, Web crawlers must act in self defense and regard all keywords and topical metadata as spam. Debating whether topical metadata are spam or an essential step towards the construction of the semantic Web assumes that they are technologically appropriate additions to Web pages. To what extent are Web pages analogues of the legacy IR document-container of information? Brewington and Cybenko (2000) observed that half of all Web pages are no more than 100 days old, while only abut 25% are older than one year. Cho and Garcia-Molina (2000) found 40% of Web pages in the .com domain change everyday. The half-life of Web pages in the .gov and .edu is four months. Koehler (1999) found the half-life of Web content is two years. Spinellis (2003) found the half-life of URLs is four years. Markwell and Brooks (April 15, 2002) found the half-life of science education URLs to be fifty-five months. Cockburn and McKenzie (2001) found that the half-life of bookmarks to be two months. Content churn and rapid birth and death cycles distinguish Web pages from the legacy IR document-container of information. Philosophers can address the issue of repeated refreshing of the 'same' Web page that presents 'different' content each time, as to whether this is the 'same' Web page or 'different' Web pages. Whatever grist falls from the philosophical mill, it is clear that Salton and McGill didn’t consider database documents to be snapshots. Web content is only available through the mediation of a presentation device, such as a Web browser. Complicating Web presentation are security settings, different computer monitors, safe and unsafe Web colors, plug-ins, cookies, scripts, and so on. In fact, Web authors expend enormous amounts of time and energy engineering a consistent presentation across platforms. Figure 1 illustrates the process of converting HTML to a browser display for the Mozilla layout engine (Waterson, June 10, 2002). 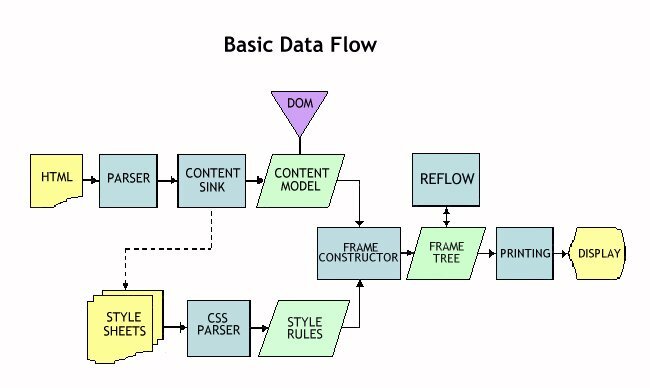 This diagram illustrates that HTML code is parsed and deconstructed into a hierarchical content model. Style sheets that reference content elements are also parsed. A frame constructor mixes content with style rules into a hierarchy of content frames. Nested content frames are painted to create the presentation in a Web browser. Figure 1 implies that different HTML parsing rules, style sheet applications, frame construction algorithms, and so on, would produce a different presentation. Turau (1999) speculated that 75% of Web pages are generated from databases. Bergman (2001) describes the 'deep' Web as 400 to 500 times larger than the 'surface' Web. The deep Web is composed of database generated pages. Web pages are presentation contingencies and server programming artifacts. This schism between content and presentation distinguishes them from the legacy IR notion of document-container of information. The document in your Web browser may look like a document, but probably has no documentary origin at all. An index helps searchers find information in a database. It is generally true that success in finding information in a database is directly proportional to knowledge about how the database documents were indexed. Database vendors such as the Dialog Corporation are famous for running classes helping searchers understand how information is indexed. Google is a popular search tool for Web content, twice voted most outstanding search engine by the readers of Search Engine Watch. In August 2002, about 28% of Web search was done with Google (Sullivan, 2002b). 'Google gets 150 million queries a day from more than 100 countries' (Harmon, February 17, 2003). Google is famous for presenting results according to page rank, but nobody knows how Google’s parsing algorithm works. We will not comment on the individual reasons a page was removed and we do not offer an exhaustive list of practices that can cause removal. However, certain actions such as cloaking, writing text that can be seen by search engines but not by users, or setting up pages/links with the sole purpose of fooling search engines may result in permanent removal from our index. (http://www.google.com/Webmasters/2.html).... Google's complex, automated methods make human tampering with our results extremely difficult (http://www.google.com/technology/index.html). Google does not attempt to cover the entire Web. It systematically excludes Web sites with doorway pages or splash screens, frames and pages generated 'on-the-fly' by scripts and databases. Jesdanun (October 25, 2002) reports content removed from Google to satisfy national prohibitions. Many Web pages also include objects Google finds opaque such as image files and applets. Increasing numbers of Web presentations have no text at all: 'Graphic design can be content where users experience a Web-site with little or no "text" per se'. (Vartanian, 2001). Legacy indexing algorithms were open for inspection. Adding topical metadata to Web pages in the hope that Google will harvest them is betting on an unknown indexing strategy. Google will no tell you what it did with your topical metadata because being a black box is a corporate survival strategy. The preceding survey of Web technology indicates that Web pages make poor hosts for topical metadata. This is not an evaluative judgment about topical metadata themselves, but merely an observation that they are misapplied to a technology characterized by churning content in arbitrary presentations parsed by unknowable algorithms. The cost and effort of adding topical metadata to an information structure is only recouped if that information structure persists in time with a predictable structure, identity and contents. An example of such a structure is the legacy IR document-container of information. Topical metadata await their more appropriate application on the Web in environments where the technical and social factors supporting the IR document-container of information can be re-created. This can be done by 'closing' the Web. The legacy technical and social environments supporting IR in document databases are sketched above. It is possible to re-create this environment on the Web behind passwords in venues such as intranets, enterprise computing, and digital libraries. These applications are driven by social groups that can reach agreements on information structure and topical metadata. For example, a social group can arbitrarily decide to construct and present its information in HTML or any other presentation technology. It can also decide to use the meta keywords tag or Dublin Core metadata with its choice of thesaurus of indexing terms and phrases. Social agreements take precedence over technology in closed Webs where the Web is reduced to a communications venue. Predictability in structure and meaning is the fundamental facilitator permitting in-house Web crawlers to harvest topical metadata for the retrieval benefit of the local community. In a closed Web, one can build a legacy database and do IR. If our terms of reference are a closed Web, then the topical metadata controversy recognizes topical metadata as important elements of a semantic (i.e., 'closed') Web. Now and in the future, Google and similar tools will scan billions of Web presentations on the open Web. Everyday searchers will use Google to find information, and many will characterize their activity as retrieving information, despite disappearing Web pages, rotten links and Web content that changes on each viewing. The open Web is a network where the cost of entry is merely access to a server machine. There are no social conventions about who can author a Web presentation or what can be presented. It is an unconstrained environment where initiatives requiring Web authors to add indexing terms and phrases or to structure their Web pages a certain way are doomed to failure, or will be exploited by the unscrupulous. In the open Web there is no guarantee that Web presentations will remain or that servers will continue to function. Many will use the Web to 'retrieve information,' but they are engaged in Web search, a process of constant discovery, not retrieval. The only way to preserve a Web presentation is to cache it, which is to take a snapshot of a snapshot and thereby create a new static representation of a continuously evolving process. The open Web challenges us to ransack our IR legacy of concepts and methods to find any that can be applied. But it is possible that the open Web is so novel a technological platform that we will be forced to recognize that our IR legacy of concepts and methods has been historicized to the modern database era of the late 20th century. Baeza-Yates, R. & Ribeiro-Neto, B. (1999) Modern information retrieval. Reading, MA: Addison-Wesley. Frants, V.I., Shapiro, J. & Voiskunskii, V.G. (1997) Automated informaton retrieval: theory and methods. San Diego, CA: Academic Press. Harmon, A. (2003) Google deal ties company to Weblogs. The New York Times Monday, February 17, C3. Houston, J. E. (2001) Thesaurus of ERIC descriptors, 14th edition. Westport, CT: Oryx Press. Luhn, H. P. (1959) The automatic creation of literature abstracts. IBM Journal of Research and Development 2(2), 159-165. Mintz, A. (2002) Web of deception: misinformation on the Internet. Medford, NJ: Information Today. Salton, G. & McGill, M.J. (1988) Introduction to modern information retrieval. New York, NY: McGraw-Hill. Wiegand, W.A. (1996) Irrepressible reformer, A biography of Melvil Dewey. Chicago, IL: American Library Association. Yates, J. (2000) Business use of information and technology during the industrial age, in A Nation transformed by information: how information has shaped the United States from Colonial Times to the Present, edited by A.D. Chandler & J.W. Cortada. pp. 107-136. New York, NY: Oxford University Press.